Anna Williams and I have been working together, almost from the day she started repairing carpets towards the end of 1992. In that time Anna and I have become firm friends with a mutual love of oriental carpets and the cultures and the traditions they embody, and of course the people who make them. I admire her immensely, not only for her skills as a carpet repairer but also for the integrity that she brings to whatever she takes on. 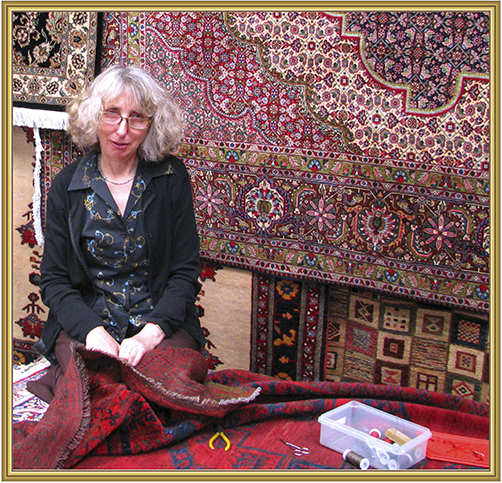 In 2005 Anna asked me if I could make arrangements for her to go to Iran to work with people I knew who repaired carpets. She felt she needed, in her words, “to hone her skills”. This was easy enough for me to organise but I remember thinking at the time that she could probably teach these repairers a thing or two. Sure enough, on her return, Anna felt that overall she did a better job repairing carpets than the people she was supposed to be learning from; not because she was more skilful, but because she was more patient. I reminded her that for these people carpet repairing was just a job, but for her it had become a passion – that carpet repairing for her was just a natural progression of her love of spinning and weaving. Since then Anna has made three more visits to Iran, not so much to “hone her skills” but because of her fondness for the country, the culture and the people. Of course I have no hesitation in recommending Anna to anyone who requires a carpet or a kelim to be repaired. She is available for consultations at my warehouse most Sunday mornings from 10.00am until 1.00pm, or you can contact her directly through her website.